Bell put up a sign-up page for the BlackBerry Torch 9800 on their site back in August, and, even though it initially didn’t have a release date, Bell did say Sept. 1st via Twitter that their branded version of the BlackBerry Torch would be available on Sept. 24th. Well, it looks like the launch of the BlackBerry Torch on Bell has been moved back a week. If you head over to the Bell BlackBerry Torch page, you will see that the new launch date is October 1st. Four of the big North American GSM carriers wasted little time making their official announcements of the BlackBerry Bold 9700 coming right off the hills of the official announcement from Research in Motion. No official official release dates have been announced, however, all four carriers say that their branded version of the BlackBerry Bold 9700 will be available within weeks. Bell BlackBerry Tour Now Available! The BlackBerry Tour is now available online to Bell customers for $249.95 on a three year contract and will be available in stores starting tomorrow, July 11th. 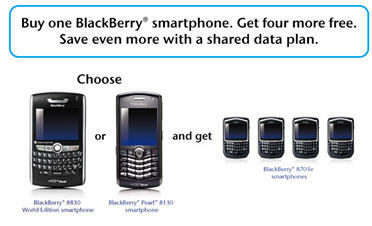 [Read more…] about Bell BlackBerry Tour Now Available! OS 4.7.0.122 for the BlackBerry Storm 9530 has been available to Bell users as a update to BlackBerry Desktop Manager since last week, however, the latest Storm 9530 OS is now up on the web, essentially making it available to whomever wants to download it. You can get OS 4.7.0.122 from Bell at the link below. Just remember that if you are not a Bell BlackBerry Storm user (read Verizon or Telus users), your carrier will not support you if you run into any issues. Note: Installing 4.7.0.122 on something other than a Bell BlackBerry Storm is a little different than installing any of the many leaked OSs that have come before it. Since .122 is carrier specific, you need to delete the vender.xml file from C:Program FilesCommon FilesResearch In MotionAppLoader after installing .122 to your desktop. Once you’ve done this just run loader.exe from the same directory. There is no need to install via Desktop Manager. Rumors have been floating around over the last week that Telus woldn’t be the only BlackBerry Storm carrier in Canada and it would appear that those rumors were correct. Bell has officcially announced that they will carry BlackBerry Storm and have put a up a “coming soon” site.